Details on how to win a copy of this book at the end of the review & a link to purchase it. It was a simple enough job. Go to Ireland, pick up an old manuscript, pass it to an agent. Twenty minutes, tops. For CIA-trained Hollis Larsson it sounded easy enough. She’s wanted to travel, but her husband Finn always finds an excuse to stay home. The kicker comes when her old friend, David, admits it’s not really Hollis he wants, but Finn. With an expertise in authenticating old things like paintings so a manuscript should be a piece of cake and no one will suspect him. Too bad that when they get to the shop, the owner is nowhere to be found. Neither is David. What have they gotten themselves into? One dead body, a death threat, and 50,000 euros later, they’re pretty sure they’re in over their heads and looking for a way out. Now they’re tracking a missing agent, can’t find the clues needed, and have at least two people tracking them. Is there no one they can trust? What starts as an errand for an old friend turns into a fast-paced thriller. First thought is, let’s get out of here! That proves to be problematic, so they must outwit their stalkers, decide who’s telling the truth, and survive. David shows up but that only makes for more problems when he admits the mission wasn’t sanctioned. In fact, he’s in trouble for setting it up so no help is coming. Hollis and Finn are a fairly boring couple as Hollis herself will tell you. The trip to Ireland was to spice up their marriage as they rely on each other. It might have created a monster in that Finn does surprisingly well and might even enjoy parts of it. I can only hope there’s a sequel so readers will know what happens next. 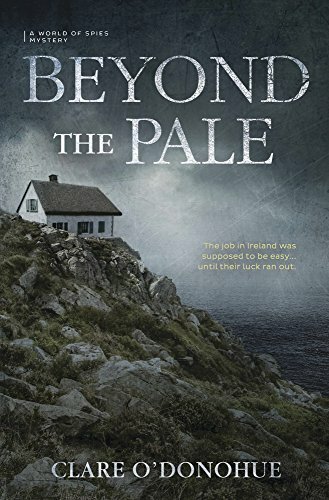 To enter to win a copy of Beyond the Pale, simply email KRL at krlcontests@gmail[dot]com by replacing the [dot] with a period, and with the subject line "pale,” or comment on this article. A winner will be chosen July 7, 2018. U.S. residents only. If entering via email please include your mailing address (so if you win we can get the book sent right out to you), and if via comment please include your email address. You can read our privacy statement here if you like. It was the cover that first drew me in, but the book sounds fabulous. Anything set in Ireland is on my TBR! This is a new author to me. I love the cover and the book sounds like a great read.